We are very much at the end of tomato season, and yet, with 90 degree days this week you'd think it was still mid-summer. Hot days don't match with apples and pumpkins and all things fall, so I went with my gut (no pun intended) and scrounged around for the makings of a beautiful salad. Most people see purslane as a weed and, indeed, it does appear that way in the yard - tentacling out onto the sidewalk and looking like a general nuisance. However, purslane is somewhat of a wonder in that it contains more Omega 3s than any other leafy plant life. Have a look here to read more! Also, marigolds are not just pretty, they are edible! Check this out for exactly how to deal with them. Now, I am not going to give you a recipe as this should be self-explanatory. Tiny little heirloom tomatoes tossed with cucumber, purslane, and your favorite vinaigrette and topped with a beauty of a marigold makes for such a pretty plate. I wish these things were available in my yard all year long. Crostata is usually a sweet dessert, but this savory preparation is a delicious and different dinner that disappears each time I make it. I make two of these as my kids are very hearty eaters. Change the onions to 1 teaspoon onion powder if you have picky eaters. Serve with a veggie and salad. 2. Remove pie crust from refrigerator and let come to room temperature before unrolling. Make sure crust is 12-inches in diameter. If not, roll until it measures correctly. 3. Place crust on an ungreased baking sheet. 4. Brown ground beef with onions and garlic and drain completely. Season with salt and pepper. 5. Stir in gravy and spoon onto pie crust, leaving an edge of 1-inch. 6. Fold pie crust just over the edge of the meat mixture and bake for 20 minutes or until crust begins to brown. 7. Add cheese to the top and bake for another 5 minutes until cheese is melted. 8. Let cool for 5 minutes and cut into 6 wedges. Pumpkin time usually means warm and comforting baked goods, but I am of the mind that milkshakes are a year-round treat. This one combines vitamin-A rich pumpkin puree, creamy vanilla ice cream and just the right amount of spice to make it the perfect cool harvest drink. 2. Pour into 2 (8 ounce) glasses and top with whipped cream. The first time I had Pilaki was several months ago when I stopped in to a local Middle Eastern cuisine restaurant, Anatolian Kitchen. My daughter Katie is a vegetarian and I knew there would be excellent options there for her on a lunch date. My food knowledge is fairly extensive as I read, breathe, and live food on a regular basis, but somehow I had never heard of this particular dish. Pilaki is a Turkish dish made of what you see here in this recipe, and is named differently for the color or type of bean being used: barbunya for red or pink beans, and fasulye with white beans. Katie really enjoyed this, so when I got home I looked up recipes and used several to come up with what I knew she would like. This is that recipe. By all means, cook your beans from dried if you have the time, but this quicker method is tasty, as well. I also have thrown everything into the pressure cooker for a quick 15 minute cook and that was delicious, as well. 1. Heat olive oil in a heavy bottomed pot, add onions, carrots, and garlic. Cook until onions are translucent, about 5 minutes, stirring occasionally. 2. Add potato, beans and tomatoes with water and bring to a boil. Lower heat to a simmer and cook for 20 minutes or until vegetables are tender and a thick stew has formed. 3. Stir in lemon juice and parsley - reserving a Tablespoon of parsley for serving. 4. Ladle into bowls and to with parsley. Here is another easy meal for busy school nights. One of my favorite uses for ShopRite Certified organic Imported Specialty Pasta is this recipe. It goes together quickly, bakes in one pan and disappears in no time. Pennoni is perfect here because the cheese and sauce get into each piece of pasta and fill them with cheesy goodness. I love ShopRite Imported San Marzano DOP tomatoes in the sauce for their rich flavor. Add a green salad for a complete meal the whole family will love. 2. Cook Penonni until al dente. Drain and keep warm. 3. Combine ricotta and egg. Blend well and add pepper and 3/4 cup of each cheese. Set aside. 4. Cook onion in oil in a small saucepan until translucent. Crush tomatoes and add to onion with basil, garlic, oregano, salt and sugar. Simmer for 20 minutes. 5. Spray a 2 quart baking dish or casserole with cooking spray and set aside. 6. Combine pasta, sauce and ricotta mixture and blend well. Pour into casserole and top with remaining cheeses. 7. Bake for 30 minutes or until bubbly and slightly browned on top. Let stand for 15 minutes before serving. I love a good sweet bread. 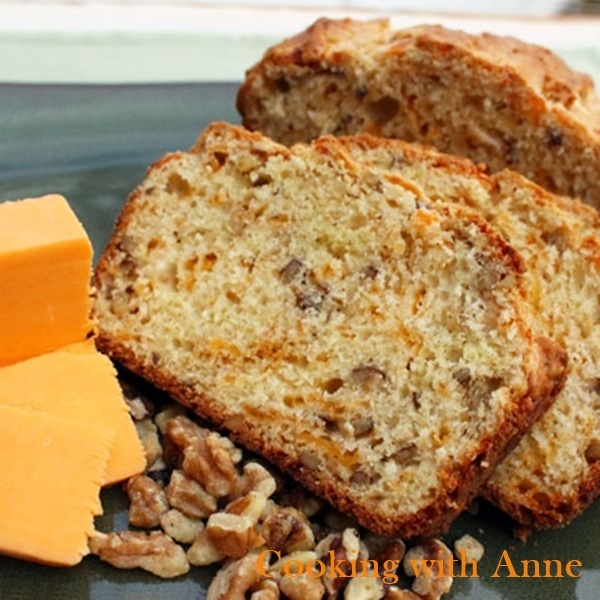 Mostly I make things like zucchini, or pumpkin, or banana, but I found myself craving the dense, moist texture of those breads without the sweetness. I wanted a delicious nut and cheese bread that wasn't dry, but also wasn't full of sugar. I searched and searched and all I could find were breads with a large crumb and too much added sugar. I experimented a lot and finally settled on this recipe. It's not as heavy as a banana bread would be, but not as light as a biscuit or yeast bread. It's somewhere in the middle with a beautiful savory flavor that's just perfect for these crisp fall days. 2. Mix together butter, oil, salt and sugar. 3. Add eggs one at a time, blending after each addition. 4. Sift together flours, salt, baking powder and baking soda--add to egg mixture alternately with milk. Mix well. 5. Add cheese and nuts and blend until combined. 6. Spoon into two greased and floured 9x5 loaf pans. 7. Bake at 350 degrees F for 1 hour until a toothpick inserted in the center of each loaf comes out clean. I love the versatility of this dish. It's packed with heart-healthy everything and tastes wonderful hot or cold. Add different vegetables to your liking and change up the cheese if you so wish. 1. Toss vegetables with olive oil and garlic and lay on an un-greased baking sheet. Bake at 425 degrees F for 15 minutes, or until vegetables begin to brown on the bottom. Set aside. 2. Cook quinoa according to package directions. This is usually 1 cup of quinoa, rinsed very well, and 2 cups of water with salt brought to a boil, reduced to simmer, and cooked for 10-12 minutes. 3. Combine veggies, quinoa, and dressing and fold together until well blended. Top with feta cheese. Eat hot, room temperature, or cold. This lighter take on sausage and peppers is a great weeknight meal that takes very little time to prepare. I use leftover sausage links that have already been cooked to make prep time faster. The tri-color peppers add color and flavor, but if only green are available, that works well, too. Serve with a bagged green salad for a quick back-to-school dinner. 1. Heat a large skillet over medium-high heat and add olive oil. Add peppers and cook briefly until they just start to soften, about 4 minutes. Add garlic and stir. 2. Pour in stock and cook for 2 more minutes. 3. Toss sausage slices with peppers and add in pasta. Toss well so all ingredients are combined. 4. Add basil and salt to taste before serving hot. FOOTBALL! Yes, that's right, on Thursday, September 7, 2017 it's football season again. I'm excited, can you tell? Aside from some minor issues and wondering about players and who will stay and who will play, the Steelers still have it going on and I'm crossing all I have for a spectacular season! On to the dip - this was originally published at Family.com on my blog, and even made its way to ESPN (still there!). No football game is the same without excellent nosh and this is a great start to this season's football food. Seven layers add up to one delicious dip that is a favorite everywhere. The best part of this recipe is that you can substitute any fat percentage in the beans and dairy products without affecting the flavor of the finished product. 1. Combine refried beans with taco seasoning and blend well. Set aside. 2. Mix together sour cream with lime juice and cilantro. Set aside. 3. 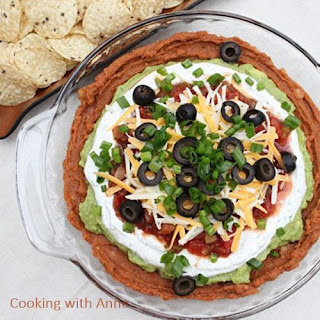 In a 10-inch pie plate or 9x9 baking dish, spread refried beans and top with guacamole, sour cream mixture, salsa, shredded cheeses, sliced olives and green onion. 4. Cover tightly with plastic wrap and store in the refrigerator until serving time, or serve immediately with corn chips. This simple Chili and Chips is one of my kids' favorite one-bowl meals, and mine, too! It goes together in one pot and prep-time is super fast. Choose whatever type of tortilla chips you like. Our family goes bean-less and the kids don't like chunks of tomatoes, but any type of tomato can be added along with beans for a heartier chili. 1. Brown ground beef well, breaking up as it cooks to keep any large lumps from forming. 2. Drain excess fat and add tomatoes, stock and seasonings. 3. Simmer for 30 minutes and serve in bowls with corn chips and desired garnishes. Two classic flavors combine in one decadent little bite. These are so delicious and easy to prepare that nobody will know you didn't slave away in the kitchen for hours. These are like the ones you buy at your local store bakery, but so much better! 1. Preheat oven to 350 F. Line 24 mini-muffin cups with paper liners or grease well. 2. Melt chocolate chips and butter together until smooth and let cool to room temperature. Set aside. 3. In another bowl, mix flour and salt together and set aside. 4. Mix eggs and brown sugar together with orange zest. 5. Add chocolate mixture to egg and sugar and stir until well blended. 6. Stir in flour until just combined. 7. Divide evenly into muffin cups and bake for 12-15 minutes until the edges are set but the centers are moist and fudgey. 8. Cool for several minutes before frosting. 9. For frosting, blend butter and zest together well. Add powdered sugar a cup at a time and orange juice last. Mix until fluffy.